Gilbert garage door repair is a locally owned, family operated business. We have been servicing Gilbert and the east Valley for over 20 years. If you’re looking for the best quality with top notch personal service, you’ve come to the right place. At Gilbert Garage door Repair we will give you the attention and personal service you’ll come to expect and love. We service both residential and commercial properties in Gilbert and the surrounding areas. The combination of our staff and technicians + quality products allows us to guarantee your satisfaction. Our staff is friendly and will be here to help you every and we mean every step of the way. Garage Door Services sells, installs, repairs, and services residential and commercial garage doors and openers. We believe our customers deserve the highest quality products to ensure their safety and satisfaction. We work with all of the top brands and manufacturers and can even install custom metal, wooden garage doors for the exact look you desire. 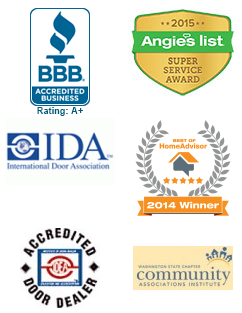 "I've done business with Gilbert Garage door Repair off and on for over 15 years. They are always prompt and polite and provide excellent recommendations. When I think of anything Garage related, I think of them. Great company, service-oriented." Why buy a new door, opener or motor when we can fix it? Don’t buy a brand new opener. Let us take a look at it first. Most of the time we can repair or replace your broken chain, or belt on your opener. It's a simple and inexpensive repair. We carry remotes, Wall buttons, extra springs, tracks and a lot more on all our trucks to try and make it a quick one stop fix. This saves you and us money. We can even program your home link on your truck or car to interface and communicate with your existing garage door opener!!! If you don't see your city listed Give us a call. Chances are we can still get you taken care of. If we can't we'd love to find you someone that can. We provide the best value for all garage door-related products and service, and use only the most dependable parts. We provide you with quality service at a reasonable price. Every single one of our garage door repair technicians are trained to code and to meet our very high quality standards. Curb Appeal…a garage door has a huge impact on your home and can greatly enhance your home’s value. Garage doors are the largest moving object inside your home. If you have a problematic garage door, it compromises the safety of your family and home. It’s more than just a garage door though, it’s also the second front door to your home. Just like your front door your garage has a list of many contributions. It acts as a security for your home. Please don’t trust anyone else but the experts. We are the best garage door repair and service company in the valley with the most professional, experienced, clean cut, well-mannered and courteous technicians. Our team of garage door technicians will repair all your broken springs, openers , motors, tracks and garage doors. When you’re ready to give your home a makeover, trust us to get the job done for you. Repair All Brands of Existing Openers- No matter the brand we carry it. If not we can order it in for you at no extra cost. Garage Door Replacement – We will replace your garage door and haul away your old one. See above for installing the new door. Electric Garage Door Openers – Repair and service of the electric garage door opener itself, Typical service includes inspection, adjustment, repair, and lubrication if necessary. Garage Door Panel Replacement – You don’t always have to buy a new garage door. Often times we can replace a panel or section. This saves you time and money and can lower the cost significantly. Garage Door Torsion Spring Replacement – This can be a very dangerous repair for an untrained person as there is a lot of torque on the spring to assist the garage door going up and down. Garage Door Cable or Broken Spring. – These can go hand in hand and possibly packaged together since the cable is used to connect the spring to the door. Garage Door Tune-up and Safety Inspections – Just need a basic tune up. Leave it to use. Our technicians can quickly evaluate what needs to be done, and make minor adjustments, lube and fine tune your garage door. Customer Satisfaction and Proven methods make us the Best When your garage door is down, we know you need to get your garage door working ASAP. Our technicians can be at your home right away. Our years of exceptional service combined with our knowledge will thrill you. We offer fast, same-day garage door repair service 24/7 days a week with no extra charges for the weekends. When you call us to your Gilbert, AZ home, you can expect up front, honest and straightforward flat rates every time. We have become one of the most respected garage door repair teams in the valley. The bases of our success and what sets us apart is due to our core values. We are excited and look forward to providing you with the best, unsurpassed quality and professional customer service as we take care of all your garage door needs. Our team is the best we are experienced in all areas of garage door repair, including panel replacement, opener repair, carriage house servicing, leveling, speed adjustment, and commercial grade garage servicing. We service nearly every major brand and style of garage door. Whether you’ve got a vintage unit that needs a tune up or a modern keypad operated garage door that isn’t working the way you want, our experienced repair staff will be able to effectively address your needs. Our business strongly believes in high quality, and fast service. We don’t want to keep you waiting for parts, that’s why we have a massive inventory of tracks, springs, motors, weather stripping, keypads, remotes, screens, and windows in stock. We take pride in carrying quality parts, by choosing the best, we’re able to offer a warranty on all of our repairs. No idea what’s wrong with your garage door? Worried it’s going to cost an arm and two legs. With Garage door repair Gilbert, you’ll never have to worry about getting ripped off. Once we give you a price that’s it no marking up or tacking on extra hidden fees. This makes it so you can confidently make the decision whether you want to move forward with the repair.